(Part Boy, part Badger) as they dice with death in an action packed yarn featuring Dragons and Asthmatic Donkeys. Performed by Paul Harry Allen (Charming – The Independent) and Katie Pritchard (One to watch – Funny Women) this is storytelling meets stand up, set in 17th Century Newport, a mad cap mixture of boys own adventure and general nonsense. Katie exists within a whirlwind of change. A professional actor, a musician mastering 12 instruments (including the rather tricky slide whistle) a Karaoke demonstrator, a writer and an award winning comedian, Katie has chosen a colourful cornucopia of professions to create the melée that is her life. As a actor, she has appeared in the West End in Dreamboats and Petticoats and as a comedian, was the winner of the Hilarity Bites new comedian of the year, and more recently was a finalist in the Musical Comedy awards 2017. 5pm - Tickets £8 in advance £10 on the door. Having rummaged his way round the UK, Paul will take you on a tour of some of the junk and charity shop oddities he’s found. From china dogs in hats to photos of people he doesn’t know, this is a delightful delve into the ridiculous, a passionate tale about his love of preserving the past. With a mixture of storytelling and stand up, Paul celebrates his love of collecting and takes a laugh at the past. Whether its tales of his frugal Nan or unfortunate phrases in films, audiences will surely love this merry mix of retro tomfoolery. ”I saw it at the Fringe. A jolly tale with a melancholic tinge. And some sharp shirting” – John Hegley. Whilst in a junk shop, looking for photographs of families he'd never met, Paul stumbled across a wad of forgotten letters, lost since the 60’s. Spanning across America, France and Edgware, Paul dusted off these lost letters of hopeful groupies and first loves to produce a fantastic show in 2010. He then went on to find some of the authors of the letters and the show returned to The Edinburgh Festival in 2013 and was even more popular. It has also been performed at London’s Leicester Square Theatre and Canal Café Theatre. 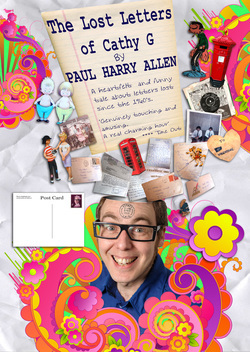 Letter writing is the old timey way of sharing Facebook statuses from over the course of a week to ten days, comedian Paul Harry Allen explains, as he uses letters to bring his audience on a trip through the 1960s in this charmingly funny show. By riffling through the correspondences of one Cathy G during her formative years, which he happened upon in a junk shop, he entices the audience to join him in his obsession with the lives of strangers. Innocently sweet and very funny, Allen manages to enthrall his audience in the summer loves of this girl and the characters that she comes across, to give a nostalgic and engaging look at our histories. Touchingly told with real intimacy, The Lost Letters of Cathy G is a journey through the real-life love letters of teenager Cathy G, rediscovered by Paul Harry Allen in a chart shop. Granting a new perspective on the 1960's, the show is perfectly suited to the Free Fringe, and is the sort of production you go up to Edinburgh to find. Paul Harry Allen has gone into real detail in order to tell this journey, giving us letters from a string of wooers on Cathy's behalf, as well as pen-pals and friends, photographs and music. His storytelling is superb, he has a real understanding and warmth for each of the people in the story, which soon rubs off on the audience. It's incredible how much of a person's character we can sense in their writing, and you do can a real sense of sadness that letter writing is on its way out after watching the show. From France to America, from Edgware to Wales, from Jimi Hendrix and Cat Stevens to Mrs Miller, the show travels far in very little time. An absolute pleasure to watch, this is easily top of my Free Fringe list, if not my Edinburgh list.